When Germany signed the armistice ending hostilities in the First World War on November 11, 1918, its leaders believed they were accepting a "peace without victory," as outlined by U.S. President Woodrow Wilson in his famous Fourteen Points. But from the moment the leaders of the victorious Allied nations arrived in France for the peace conference in early 1919, the post-war reality began to diverge sharply from Wilson's idealistic vision. Five long months later, on June 28-exactly five years after the assassination of Archduke Franz Ferdinand and his wife in Sarajevo-the leaders of the Allied and associated powers, as well as representatives from Germany, gathered in the Hall of Mirrors at the Palace of Versailles to sign the final treaty. 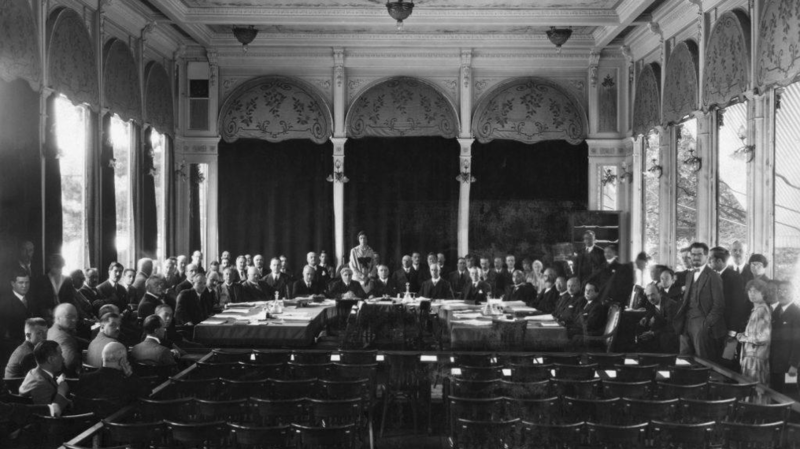 By placing the burden of war guilt entirely on Germany, imposing harsh reparations payments and creating an increasingly unstable collection of smaller nations in Europe, the treaty would ultimately fail to resolve the underlying issues that caused war to break out in 1914, and help pave the way for another massive global conflict 20 years later. Formal peace negotiations opened in Paris on January 18, 1919, the anniversary of the coronation of German Emperor Wilhelm I at the end of the Franco-Prussian War in 1871. World War I had brought up painful memories of that conflict-which ended in German unification and its seizure of the provinces of Alsace and Lorraine from France-and now France intended to make Germany pay. The "Big Four" leaders of the victorious Allied nations (Woodrow Wilson of the United States, David Lloyd George of Great Britain, Georges Clemenceau of France and, to a lesser extent, Vittorio Orlando of Italy) dominated the peace negotiations. None of the defeated nations were invited to weigh in, and even the smaller Allied powers had little say. 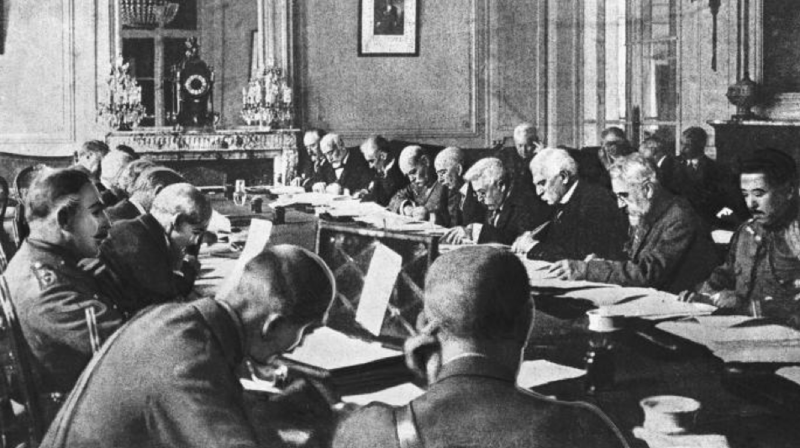 Though the Versailles Treaty, signed with Germany in June 1919, was the most famous outcome of the Paris Peace Conference, the Allies also had separate treaties with Austria, Bulgaria, Hungary and Turkey, and the formal peacemaking process wasn't concluded until the signing of the Treaty of Lausanne in July 1923. Faced with the seemingly impossible task of balancing many competing priorities, the treaty ended up as a lengthy and confusing document that satisfied no one. "It literally is an attempt to remake Europe," says Michael Neiberg, professor of history at U.S. Army War College and author of The Treaty of Versailles: A Concise History (2017). "I'm not one of those people who believes the treaty made the Second World War inevitable, but I think you could argue that it made Europe a less stable place." In Wilson's vision of the post-war world, all nations (not just the losers) would reduce their armed forces, preserve the freedom of the seas and join an international peacekeeping organization called the League of Nations. But his fellow Allied leaders rejected much of his plan as naive and too idealistic. The French, in particular, wanted Germany to pay a heavy price for the war, including loss of territory, disarmament and payment of reparations, while the British saw Wilson's plan as a threat to their supremacy in Europe. 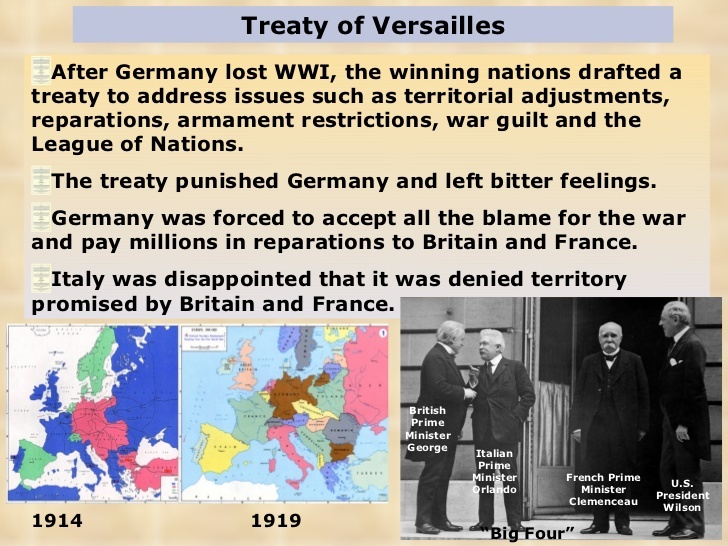 But though most Germans were furious about the Treaty of Versailles, calling it a Diktat (dictated peace) and condemning the German representatives who signed it as "November criminals" who had stabbed them in the back, in hindsight it seems clear that the treaty turned out to be far more lenient than its authors might have intended. "Germany ended up not paying anywhere near what the treaty said Germany should pay," Neiberg says, adding that hardly anyone had expected Germany to be able to pay the entire amount. And despite the loss of German territory, "there were plenty of people who understood as early as 1919 that the map actually gave Germany some advantages," Neiberg points out. "It put small states on Germany's borders, in eastern and central Europe. It eliminated Russia as a direct enemy of Germany, at least in the 1920s, and it removed Russia as an ally of France. So while the treaty looked really harsh to some people, it actually opened up opportunities for others." The war guilt clause was more problematic. "You have to go back to 1914, when most Germans believed they had entered the war because Russia had mobilized its army," explains Neiberg. "To most Germans in 1919, and not just those on the right, blaming Germany specifically for the war made no sense. Especially when they did not put a war guilt clause on Austria-Hungary, which you could reasonably argue were the people that actually started this." Taken as a whole, the treaties concluded after World War I redrew the borders of Europe, carving up the former Austro-Hungarian Empire into states like Yugoslavia, Poland and Czechoslovakia. As Neiberg puts it: "Whereas in 1914, you had a small number of great powers, after 1919 you have a larger number of smaller powers. That meant that the balance of power was less stable." Meanwhile, Germany's economic woes, exacerbated by the burden of reparations and general European inflation, destabilized the Weimar Republic, the government established at the end of the war. Due to lasting resentment of the Versailles Treaty, the National Socialist (Nazi) Party and other radical right-wing parties were able to gain support in the 1920s and early '30s by promising to overturn its harsh provisions and make Germany into a major European power once again. In 1945, when the leaders of the United States, Great Britain and Soviet Union met at Potsdam, they blamed the failures of the Versailles Treaty for making another great conflict necessary, and vowed to right the wrongs of their peacekeeping predecessors. But Neiberg, like many historians, takes a more nuanced view, pointing to events other than the treaty-including the United States not joining the League of Nations and the rise of the Stalinist regime in the Soviet Union-as necessary elements in understanding the path to the Second World War. "In my own personal view as a historian, you need to be really careful directly connecting events that happened 20 years apart," he says. "A different treaty produces a different outcome, yes. But you shouldn't draw inevitability. It's part of the recipe, but it's not the only ingredient."